The editors and review board for The Journal of Social Media in Society are excited to share the latest issue with you. The Journal of Social Media in Society is blind peer-reviewed, open-access, online journal that accepts scholarly articles and book reviews. The journal is devoted to scholarship and commentary on social media and its impact on society. The objective of JSMS is to advance the study of social media with current literature based on theory, research and practice from all methodological frameworks. 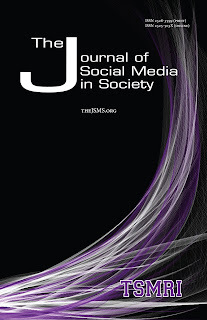 The journal welcomes papers on all aspects of social media, such as interactive online platforms and mobile technologies used to connect, share, discuss, and collaborate. The publisher of JSMS is the Texas Social Media Research Institute (TSMRI), a group of faculty, staff, and students at Tarleton State University with a mission of conducting social media research; sharing social media best practices; and providing social media education for students, non-profit organizations, state agencies, school districts, and higher education institutions.